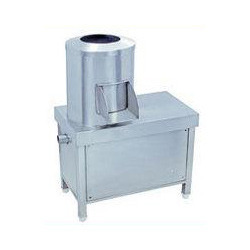 Manufacturer of a wide range of products which include potato peeler machine. Under the strict vigilance of our technical professionals, we are offering an impeccable assortment of Potato Peeler Machine. Our offered range is extensively used as an instrument for peeling food items in various food processing industries. Our offered range is availed in a variety of technical specifications to choose from. The offered range is precisely manufactured at our ultra-modern production unit following industry defined guidelines and standards. The offered range can also be availed from us at the industry leading prices. It is used for Potato peeling. The main structure is made by mild steel (MS) tube frame. SS hopper with feeding screw for product feeding. Looking for Potato Peeler Machine ?